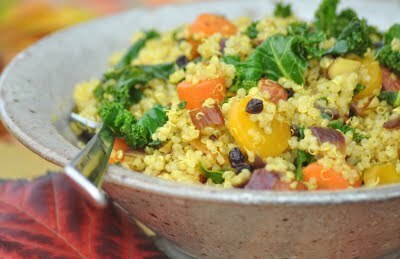 In heavy, shallow casserole or deep skillet, toast quinoa in oil over low heat until light golden. Add cinnamon and cardamom. Stir and continue toasting for 1 or 2 more minutes. Add remaining ingredients except for water; stir for 1 minute. Add water and bring to a boil, stirring two or three times; reduce to a simmer. Cover; allow to steam until all water is absorbed and quiona looks fluffy, about 20 minutes.